According to The National Institute on Aging, approximately 7 million Americans are long-distance caregivers who commute at least an hour one way to provide care to an aging or disabled relative. Although considerable time is spent on travel, many caregivers feel as if they are not giving enough time to their loved one. This frustration has led many to search out other alternatives, such as hiring an in-home caregiver that can help manage care when family is not around. Helpful homecare systems and homecare software, such as ClearCare Online, has helped bridge the gap between family members and their senior loved ones. In addition to homecare systems and homecare software, which offers point-of-care transparency, there are many other innovative technologies that keep families connected. Online Social Networking. Social media sites such as FaceBook have taken the internet by storm. It has never been easier to keep in touch with friends and family around the globe by simply logging onto a computer or mobile device. Seniors can check out pictures and updates from all their loved ones – near or far. Video Chatting. 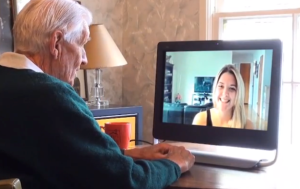 Free services such as Skype and FaceTime gives families the opportunity to see their long-distance relatives face-to-face. These programs can be used with a computer or mobile device, and have been designed to be user-friendly. Similarly, homecare systems and homecare software like ClearCare Online have been developed to keep families connected – even long-distance. A secure, web-based portal allows children and grandchildren to virtually “see” what is going on with their older loved one. Instagram. Photo-sharing programs like Instagram make it possible to view family photos without having to create a FaceBook account – or even have a computer. Seniors can sign up for this free app on their Smart Phone or tablet. Caregiver Applications. In addition to Instagram, there are dozens of helpful apps available for Smart Phones and tablets that help keep family caregivers in the loop – everything from appointment reminders to medication management tools. Rather than having a different app for everything, many families find homecare systems or homecare software have everything they need in one convenient location. Geography is no barrier for homecare systems and homecare software like ClearCare Online, which helps families stay connected, even long-distance.